Does employee retention keep you up at night? Today's volatile economy presents several challenges for large organizations. Companies are forced to make smarter decisions in half the time, or remain behind the competition. It's important to understand that your greatest asset - your employees - need recognition in order to drive business results. 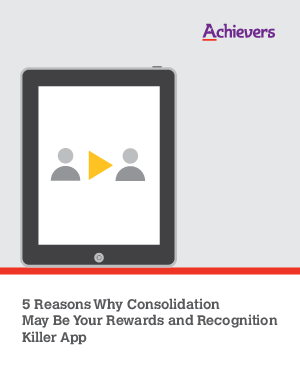 Paul Hebert's whitepaper, 5 Reasons Why Consolidation May be Your Rewards and Recognition Killer App, reveals how your organization can save money by having one, consolidated recognition platform. By combining technology with recognition programs, you can harness the way you drive employee success. Specifically, you will be able to create a leaner, faster, results-driven machine. Read this whitepaper to learn the benefits of having one recognition platform instead of disconnected, immeasurable efforts. You will be able to provide better data for faster decision making, and communicate consistent messaging to a widespread, diverse workforce.